Microsoft Excel on the iPad was a very significant element of the Microsoft announcement on March 27th by CEO Satya Nadella. 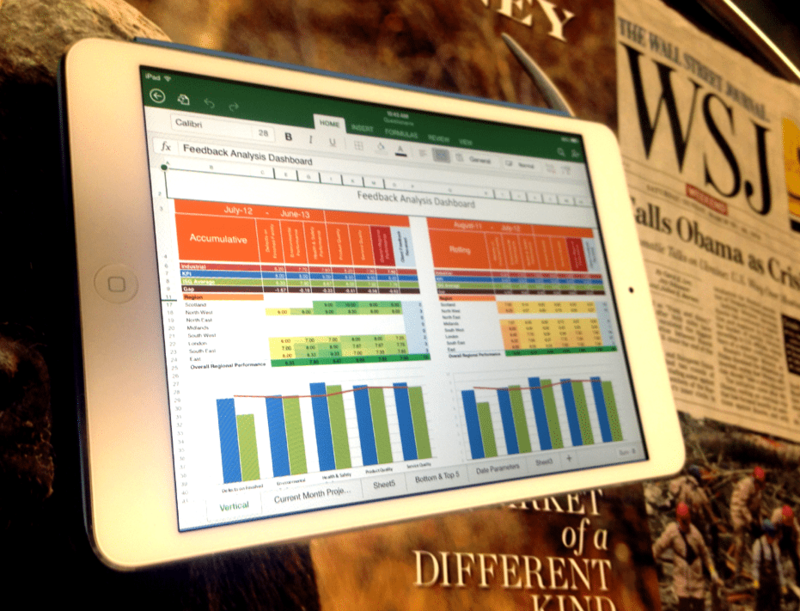 There had been clunky ways of viewing Excel documents in the past, but today’s announcement makes iPad a 1st class citizen in the world of accessing and editing information in spreadsheets. There are literally billions of spreadsheets with valuable information locked inside them, silo’d to only be accessed via desktop PC’s or Windows Tablets, however today’s announcement means that spreadsheets are now a viable means to natively distribute information via the iPad. Excel to this day operates in many vital aspects of running a business, the usecases for using spreadsheets are literally unbounded. There has yet to be a major break in Excels dominance, Google Docs is certainly making great progress and a worthy alternative for basic spreadsheet usage. But Excel is not only used for adding a few numbers together, it is also broadly used as a Business Intelligence, Analytics and a Modelling platform. In fact many would say that Excel is the most used Self Service Business Intelligence software on the planet today. Self Service really is the key term here, literally everyone in the information workforce today has some level of Excel experience. No doubt their is a very wide range of capabilities, some may just consume and add a number or two together, others dive deep into Pivottables, VLookups and Macros. Regardless of abilities; it’s familiar user interface and installed base (1 billion accordingly to Microsoft) is virtually ubiquitous, and this is what makes Excel the most pervasive Self Serve BI product to date. Of course the term ”installed base” is also an important term here, as it now encompasses tablet devices, Excel’s ubiquity is gravelly under threat under the explosive growth of the tablet product category, none of which (prior to the Office iPad announcement) had Excel installed. After the announcement, only a fraction of those devices will have Excel installed. The [somewhat] saving grace for Excel is that there has been no major alternative in the tablet space, Apple’s numbers and Google Docs have nipped away but no-one can declare either of those tools to be an “Excel Killer”. Satya pushed the mantra of being Mobile-First and Cloud-First, both very much go in hand in hand in enabling content to flow freely from device to device. Microsoft’s OneDrive cloud storage helps to deliver the files from your local PC to the cloud, enabling the iPad and future devices to access to them for consumption and modification. In over 20 years, Excel has vehemently stood the test of time whilst plenty of dedicated BI products have simply come and gone. The advent of mobility was probably the biggest technological shift which may have ‘forced’ Excel off its dominant perch. This ‘better late than never’ situation helps to maintain Excel’s position as the world’s leading productivity tool, only time will tell how much damage was caused due to its delay. Excel for iPad coupled with products like Clear Analytics help inject clean, accurate and auditable data into spreadsheets, enabling a more controlled and collaborative self service business intelligence environment for companies. Download a free Personal Edition and enable more accuracy, control and trust to your spreadsheets.